What a sweet painting! Love it! Thank you, Trish, Nadia and Lory!! I love it! That was pretty much me as a child! Although I always had a hard time finding other kids who liked to read as much as I did. 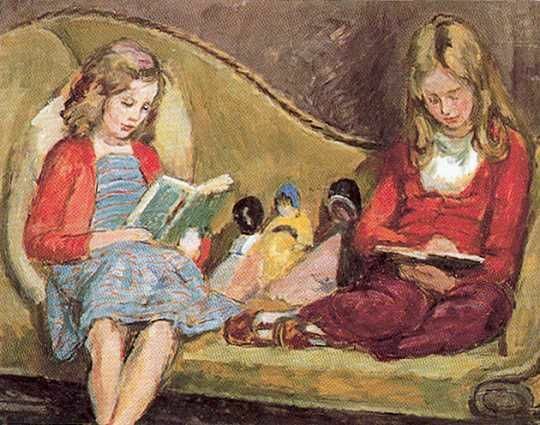 Not only the scene of children reading, but the fact that Vanessa Bell painted it! That's what drew me to this picture, too; I knew Bell painted, but not that she was this talented! That's the way I remember my childhood :). Perfect picture, perfect quotation. Thanks! :) It's very reminiscent of my childhood, too. That's a lovely picture, Lark! Reminds me of my younger self reading with my sister. Those are some great memories to have! So funny that so many people have the same kind of memories. I love you bookish art, as always!